A ceasefire starting from 9 am local time (0600 GMT) on February 6 has been suggested by the Donetsk militia, in order to provide a corridor so that civilians in Debaltsevo can leave the conflict area. Kiev has reportedly agreed to hold fire. The proposal for the local ceasefire was initiated by the militia, the Donetsk defense ministry representative Eduard Basurin announced on Thursday. The corridor should give people caught in the fighting in and around the town of Debaltsevo the chance to flee the area, Basurin said. Kiev's military officials have confirmed their agreement to the ceasefire, according to Basurin. 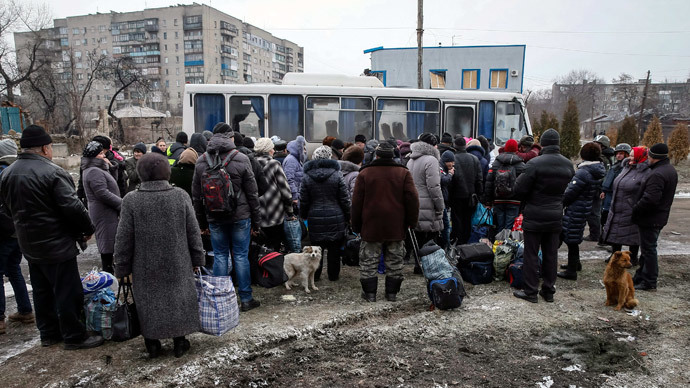 Debaltsevo residents will have a choice of which safer area to head to, the DNR representative at the Minsk talks, Denis Pushilin, told Russia’s Rossiya 24 news channel. He said that people can choose between areas controlled either by Kiev or the militia, to be evacuated to the towns of Artyomovsk or Donetsk respectively. The announcement of plans for the localized ceasefire came during a series of international meetings aimed at working on devising a solution for the increasing fighting in eastern Ukraine. The US Secretary of State John Kerry visited the Ukrainian capital on Thursday following Ukrainian president Petro Poroshenko’s pleas for the US to supply arms to Kiev. German and French leaders also met with Poroshenko on Thursday, ahead of their visit to Moscow to meet with Russian president Vladimir Putin on Friday. A key international meeting in the German city of Munich has also been planned for the weekend,. Meanwhile, the Ukrainian crisis and the means by which it can be solved are to be among the key issues on the Security Conference agenda. 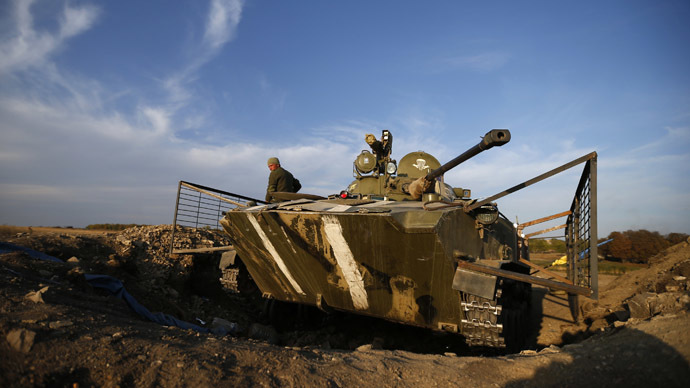 Debaltsevo has recently become the scene of heavy fighting between the Ukrainian troops and the rebels. Watch RT’s footage showing smashed-out tanks and APCs at the scene. At the end of January, there were reports that some 8,000 Ukrainian troops had been surrounded near Debaltsevo in Donbass, as militia units cut off the only road linking the pocket to Kiev-held territory. The servicemen had reportedly been offered the chance to surrender. Kiev initially denied the situation and insisted the area was under its troops’ control.